Successful programs need consistent, high quality marketing and outreach materials and resources that promote the program benefits in a way that will resonate with customers. Once you defined your target audiences and messaging based on their motivations, you devised a plan to create demand for your program that will leverage your brand using a variety of strategies and tactics. Now you can develop marketing and outreach resources to reach your audiences. The types of marketing and outreach resources that your program might use range from direct mail and advertising to one-stop-shop websites, social media content, videos, and infographics (visual representations of information or data intended to present complex information quickly and clearly). Resources can also include talking points, signage, banners, exhibits, and collateral materials that can be distributed by your marketing and outreach partners and staff at events. Whatever materials you create, they should align with your program brand’s personality, tone, messaging, and look-and-feel to reinforce program awareness and expand the impact of your materials to increase consumer demand. Share your materials internally and with partners. Using research conducted about target audiences, a brand platform, and focused messaging, marketing and outreach materials can now be developed that you and your partners will use to execute your marketing and outreach implementation plan. The following steps will help guide the development of marketing and outreach resources for your program. When developing implementation plans, you should have considered your marketing needs and taken steps necessary to build a solid, qualified marketing team made up of paid staff, volunteers, consultants, and others as needed. Programs should expect to have, at a minimum, one dedicated professional to support the program’s marketing and outreach efforts. This person will lead the marketing team–whether in-house or a qualified firm you choose—to draft, design, and deliver the marketing materials that will promote your program and its benefits in a way that will resonate with customers and consistently reflect the program’s branding strategy. Before you start creating new resources, have your marketing team develop and document a general process and timeline for developing materials. This can be in the form of a spreadsheet, chart, monthly calendar, or other platform that will be easy for all involved to understand deadlines associated with material development. It should include review time, print schedules, major events, advertising deadlines, mailing targets, and posting or distribution dates. Make sure to build in ample time for all necessary stakeholders to review and approve your materials before they are released. Always ask an editor to review the final materials before they are printed, posted, or distributed. Program materials need to look professional and be free of any typographical errors. Busy schedules, business travel, vacations, and unanticipated tasks (i.e., “fire drills”) can often make material review take longer than anticipated, so build in plenty of time for the review process. Invite contractors to suggest marketing materials they think would be helpful to present to your program’s customers. Ask contractors if they have materials they would like to include your program logo or other identifier in to distribute to potential customers. Ask contractors if they are willing to cost-share material production. Some Home Performance with ENERGY STAR Sponsors split the cost for marketing materials with contractors, saving programs money and providing contractors with more visibility or legitimacy. Learn more about engaging contractors as marketing and outreach partners in the Marketing and Outreach Identify Partners handbook. You and your marketing team can brainstorm a materials distribution plan based on target audiences, budget, and marketing and outreach strategies. The following are just a few suggestions for channels to get you started on a distribution plan, but there are many more marketing and outreach possibilities. Target Audience — Before developing any materials, you will want to determine which marketing channels are most likely to reach your target audience. If this information was not gathered during the market assessment, reach out to your marketing and outreach partners to determine if they have experience communicating with your target audience and know which outreach methods have proven most effective for reaching them. For example, you should not spend time and money developing a newspaper advertisement if research suggests your target audience does not typically read the newspaper in hard copy. Some programs with specific offerings have found targeted radio or online advertising to be a successful alternative. Tech-savvy audiences might be more responsive to scanning a Quick Response (QR) Code to visit your program's website via smartphone or signing up to participate in your program on an electronic tablet at an event. Budget — Planning ahead for what marketing and outreach materials to develop with your current budget will help prevent overspending before your campaign ends. Be cautious about overspending on the materials you produce first, such as advertisements, and not having sufficient funds to create follow up materials, such as customer surveys. Printing, videos, and advertising costs can be expensive, depending on the outlet chosen, so aim to use these outlets sparingly if budget is a concern. Because your website is likely supported and maintained by your program, using provocative marketing and outreach to drive potential customers there to read more detailed messages could be a cost-effective approach. Strategies — If your marketing and outreach strategies (see DD.5. Develop Implementation Plans) include connecting with customers at in person events, consider what you might need. If you print several copies of a handout for distribution at multiple events, it might be helpful to keep an inventory so you do not run out of materials with no time to reprint. If you are using a handout for events, ask event organizers for an attendee estimate and print copies accordingly. You will also want to track the materials used and their effectiveness to determine what is most successful in motivating consumers to act, or not. Equipping neighborhood canvassers with a branded nametag and information sheet can help validate their connection to the program, since consumers need to feel your program's representative is trustworthy and legitimate. If you are holding open houses or promoting demonstration homes, you will want to develop promotional yard signs and informational posters to promote and display at the events. Developing the following marketing and outreach materials at the start of your program could help build a solid foundation for your marketing and outreach efforts. Program logo. A logo that reflects your program’s brand is essential to creating a consistent, recognizable look-and-feel for your marketing and outreach materials. Brief program boilerplate. This one-to-two sentence description of your program can appear on marketing and outreach materials and at the bottom of all press materials to briefly and consistently tell the purpose of your program and what it accomplishes. Email or hard copy template. Whether you communicate with your audience electronically or in hard copy, you will want a template that provides a consistent look-and-feel so recipients can make a connection with other program marketing and outreach materials they might have seen. Other program components (e.g., financing, contractor engagement) can also use these templates for their communications. Website. Visiting a program website is often a call to action on marketing and outreach materials. While your website will likely consist of more than marketing and outreach materials, having a website that reflects your brand and messaging and is easy to navigate is essential to ensure those you brought in with your marketing materials take enough time on the website to learn more about your program and take the next step. Promotional flier. A brief, one page handout of your program offerings is useful for distribution at meetings or other events. Keep the piece engaging by not including too much text, but be sure it relays your program’s purpose, eligible participants, and call to action. Other fundamental materials to consider, depending on your promotional outlets, include direct mail pieces, posters, infographics, videos, banners, exhibits, or presentation templates. These are just a few suggestions; your particular program’s strategies will require development of other materials as well. Gather input from all marketing and outreach and program staff and stakeholders to help determine which foundational materials are essential for your program. Keep in mind that you will want to make sure these materials are working before committing too much time and money to them. A beautiful, glossy handout might be loved by your marketing and program staff, but if it does not resonate with your target audience, you should not keep using it. Consider testing the effectiveness of your materials with focus groups or order smaller print runs that you can reorder or revisit based on results. You can also track which materials work best with customers by including a different promotional code on each material type or campaign and asking customers to refer to that code when they call. The Assess and Improve Processes handbook provides guidance on how to monitor the effectiveness of your marketing and outreach materials. After understanding the audience you are trying to reach and the marketing and outreach channel to reach them, you are ready to use the messaging developed in the Make Design Decisions stage to develop marketing and outreach materials. ReEnergize Pittsburgh highlighted several benefits of home energy upgrades on its website homepage. In Santa Barbara County, California, emPowerSBC used marketing materials to explain how customers can participate in the program by reaching out to a personal energy advisor. Efficiency Maine showed customers the home energy upgrades it offered by posting a video. EnergySmart in Eagle County, Colorado, promoted a low-cost home energy assessment and rebates on home energy upgrades ranging from $200 to $1,000 in its promotional materials, which were aimed at customers in their snow resort community. Remember that all of your marketing materials should include a call to action (e.g., call a phone number, visit a website, snap a Quick Response (QR) Code) for the potential customer to answer on the way to getting a home energy upgrade. Without a call to action, your message could reach hundreds or even thousands of potential customers who might be interested in what your program offers but are not clear on the next step to get involved. It is important for the call to action to be easy for potential customers to answer. For example, if the call to action is to visit a website, the website's URL should be short, and the landing page should mirror the marketing piece's look-and-feel so potential customers know they are in the right place. Any messaging used on your website should be consistent with the messaging that brought the customer to the site. Also, ensure that the website navigation and necessary steps are easy to follow, so the customer is able to quickly and easy complete their call to action. Whether you decided to create a completely new program brand or leverage an existing one that already has cachet in the marketplace, strive for brand and message consistency in all of your materials to avoid confusion about what your program is and what it offers. A consistent brand helps maximize marketing resources by presenting clear messaging, images, and materials that convey your program benefits. A brand is not simply a logo on promotional materials. It is a way of presenting, promoting, and talking about your program, product, or concept. Brands manifest themselves in the language, photographs, and look-and-feel of all materials, promotions, advertising, and other techniques used to communicate program offerings to target audiences. To evoke a certain feeling, action, or behavior among target audiences, brand your program materials, whether they are meant for print or online distribution. Brands are a form of sign. Source: A Model of Brand, Dubberly Design Office, 2001. Remember that not every program needs its own, new brand identity. Consider building on existing, recognizable brands such as Home Performance with ENERGY STAR. Learn more about the ENERGY STAR brand in the ENERGY STAR Brand Book and read about the effectiveness of the brand in the National Awareness of Energy for 2013 report. Some programs have found marketing success by co-branding materials with the recognized brand of their marketing and outreach partners. If a program has a limited timeframe built into its program plan, rather than one of long-term sustainability, it makes more sense to leverage existing resources, rather than spending precious time and money trying to build a brand not meant to last. Regardless of the brand you choose, make sure you reinforce it by consistently using it in your materials since it often takes at least three "touches," or different methods of getting your message in front of customers, before a message gets through to its target audience. The majority of people need to be exposed to a product message at least three times (on separate occasions) to buy into it, according to the "three-times convincer" concept, which is the result of broader research on the subject summarized in an article on "effective frequency" published in the July/August 1997 issue of the Journal of Advertising Research. Source: What Does Effective Frequency Mean in 1997, article from the Journal of Advertising Research. John Philip Jones, Syracuse University. 1997. Appropriate use of the program's name, messages, facts, and statistics. Keep in mind that your program brand should be reflected in all of the materials that your customer might come in contact with, not just marketing pieces. For example, if customers are asked to complete an application form to participate in your program, make sure the form look and feel follows your program brand. Additionally, if contractors distribute materials to the customer (e.g., surveys, informational pieces about what the home energy assessment or upgrade entailed) these pieces should also reflect your programs brand. To ensure compliance with your branding guidelines, you might request that all customer-facing materials from your program go through your marketing team for a brand compliance review before they are distributed. Michigan Saves, formerly BetterBuildings for Michigan, developed its Brand Standards Tool Kit so program staff could use a consistent look and feel, messages, and tone to promote the program. The toolkit includes information on proper logo usage, the program’s color palette, and typography. The toolkit enabled the program to consistently roll out a variety of materials to tens of thousands of homeowners living in 58 residential areas across the state. Source: Michigan Saves, Brand Standards Tool Kit, 2010. Source: The Missouri Agricultural Energy Saving Team — A Revolutionary Opportunity (MAESTRO), 2012. Source: Milwaukee Energy Efficiency, 2011. When developing branded materials to help bring attention to your program, there is no secret formula for what works and what does not. As a rule of thumb, think about who your target audiences are, what messages will resonate with them, and which messengers are best positioned to deliver those messages for you. Consider both "tried and true" marketing techniques, as well as less traditional information dissemination channels. The following examples from Better Buildings Neighborhood Program partners demonstrate traditional and more modern materials used to motivate customers to undertake home energy upgrades. You do not need to overcomplicate your materials with a lot of "bells and whistles." Sometimes the most effective marketing methods are as simple as an old-fashioned letter. For example, Community Power Works (CPW) in Seattle, Washington, used traditional direct mail to reach a specific market segment homeowners with oil heating. Although CPW sent a glossy insert and other mailings, the piece that really worked to generate interest in the program was a simple letter that was branded with the City of Seattle's logo, which introduced residents to the program incentives in a clear and straightforward way. The city's logo had a credibility, trust, and familiarity, which a new program could not hope to have. Source: CPU Letter, Community Power Works, 2012. The California Center for Sustainable Energy used signs to promote demonstration home tours where homeowners could view installed energy efficiency upgrades and talk with the contractor who completed the upgrades. Residents who upgraded their homes through Nashville Energy Works used yard signs to encourage others to go green and save energy. 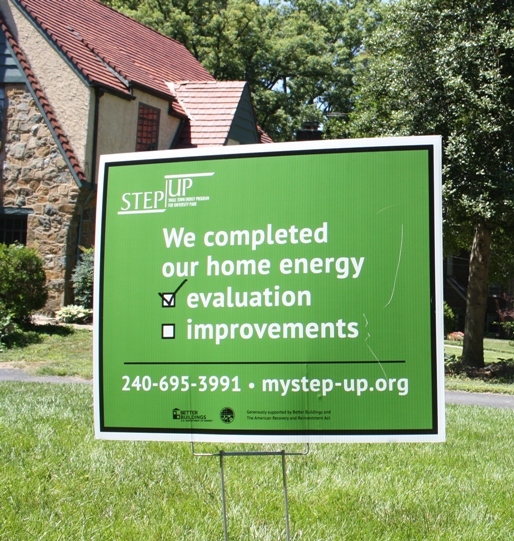 In University Park, Maryland, homeowners that participated in the STEP-UP program received a yard sign with two possible boxes that could be checked: one for a home energy assessment, one for an installed upgrade. Once the home assessment was completed, homeowners received a yard sign with the first box checked. When the home energy upgrade was completed, they received a sign with both items checked. Source: Small Town Energy Program, University Park, 2012. Some programs have been successful at bringing home energy upgrade benefits to life by sharing the experiences of satisfied customers. A "Case Studies" page on the Michigan Saves website allowed customers to boast about their upgrade experience. The Local Energy Alliance Program (LEAP) in Charlottesville, Virginia, created profiles on the success stories of many of its customers. Source: Local Energy Alliance Program website, 2014. Advertising materials that tap into what is at the forefront of many peoples' minds during various times of year, such as cold winter weather, holidays, and summer vacations, can help attract program participation. The EnergyWorks program in Philadelphia focused an advertising campaign on the weather. On hot days, for example, an animated banner on weather-related websites enticed visitors to click over to the EnergyWorks website with words such as "ice cream" and "central air." During this campaign, the EnergyWorks website accrued 15,000 visits, which helped double traffic to the program website and utlimately helped quadruple the number of home energy assessments completed. View the presentations, “Leveraging Seasonal Opportunities for Marketing Energy Efficiency” and “Leveraging Holidays and Other Events,” for more program examples of how to appeal to audiences using timely, themed messages. An opportunity for recognition entices some homeowners to complete home energy upgrades. Illinois Home Performance, a Home Performance with ENERGY STAR Sponsor, gave certificates to homeowners once they completed an upgrade. The program also encouraged homeowners to talk to their real estate professional about the home energy upgrade and ask them to attach a digital copy of the certificate to the home's listing on the Multiple Listing Service. Energize New York provided a different color medallion to homeowners who completed upgrades based on the level of energy savings achieved (0-10%, 11-20%, 21-30%, 31-40%). Milwaukee Energy Efficiency developed a certificate that congratulated homeowners and included information about the work that was performed. Source: Silver Certificate of Completion, Illinois Home Performance, 2013. Find more examples of advertising that leveraged common themes consumers may be thinking about in the Program Materials section in this handbook's Examples tab. Programs have used the latest information technology to create demand for upgrades. In Charlottesville, Virginia, the Local Energy Alliance Program (LEAP) used electronic tablets and online tools that show homeowners how their typical energy use compares to their neighbors to make the case for upgrades. The Neighbor to Neighbor Energy Challenge used an online leader board to track communities' progress toward reducing home energy use. The Neighbor to Neighbor Energy Challenge engaged residents in 14 Connecticut towns to reduce their home's energy use by 20%. As residents joined and took actions to help their household, they earned points that were redeemed for community energy projects. The Neighbor to Neighbor Energy Challenge website tracked these points via the online leader board, bolstering the competition among the participating communities, where everybody won, but some more than others. Source: Neighbor to Neighbor Energy Challenge website, 2011. To reach residents where they gather and help them understand the impact of their energy use, RePower Bainbridge in Washington developed innovative Island Energy Dashboards that displayed real-time energy use at kiosks, in local businesses, on the island's commuter ferry, and online. Source: RePower Bainbridge website, 2014. For more information about using social media in residential energy efficiency outreach, see the Better Buildings Residential Network’s Social Media Toolkit. If your target audience includes a non-English-speaking segment, translating materials into another language will make your message more engaging. Be mindful, however, of the language used (there are many different Spanish dialects, for example) and use a native speaker to translate or proof your translated materials. To address its significant Hispanic population, Energize Phoenix not only created Spanish-language materials but also changed the messaging and the materials themselves to appeal to this demographic. Energy Upgrade California's website can be viewed in multiple languages, including English, Spanish, and Vietnamese, to appeal to its diverse population. Source: Energy Upgrade California website, 2014. At the Better Buildings Neighborhood Program Business of Energy Efficiency Workshop in 2011, Better Buildings Neighborhood Program partners brought samples of their marketing materials. This image features some of these materials. Source: U.S. Department of Energy, 2011. Pay per click advertising can be a cost-effective approach to using your marketing dollars. You can purchase advertisement space on search engines like Google, Bing, or Yahoo, and your ad appears when users search related terms. If users click on your ad, you pay. If users do not click your ad, you do not pay. If these advertisements are not managed properly, however, your ad can be clicked by mistake or by a user who will not end up being a customer. To ensure that your marketing dollars are well spent if you decide to purchase pay per click advertising, read about the seven common mistakes pay per click advertising purchasers make and ways to avoid them as presented in an article by Peter Troast of Energy Circle Pro in The Building Performance Institute’s Performance Matters newsletter. As you develop your materials, keep in mind that one touch is not enough. Consider multiple ways to reach your potential customers to increase the chances that customers will internalize the messages in your materials and take your call to action. (See the Tip for Success, Follow Through With Customers, for more information). Multiple touches could come from following up with multiple direct mailings; making phone calls or sending personalized letters; promoting through television, radio, or online advertisements; in-person events and outreach; or new and creative approaches that will reach your target audience. When your marketing materials are final, your marketing staff can be eager to get them out on the street. Before releasing any of your materials, however, it is important to make sure relevant program staff are familiar with the materials, messaging, and program goals that are about to be shared with the public. All program staff and stakeholders that may come in contact with potential customers (e.g., customer service representatives, contractors, program representatives who attend public events) should be introduced to the marketing materials, messaging, and program goals so they can respond appropriately to inquiries and leads related to the materials. Holding a briefing, meeting, or training with relevant staff will be crucial to introduce the marketing materials and field any questions staff have related to the messaging on the materials (i.e., benefits, incentives) or how and when to use the materials. It is much better to raise and answer questions in a briefing, meeting, or training for the first time, rather than have your program’s representatives in the field appear unknowledgeable or unprepared.